I have been fielding a lot of questions about the mudroom built-ins I posted last month, and I wanted to do a post with answers to the frequently asked questions. I hope to update this post with any new questions that happen to come up about that project. 1. How are they holding up? Do you worry about the TV stand supporting the weight of people sitting on it?So far the built-ins are holding up beautifully. They have gotten a little dirty in the garage, but nothing that can't be wiped down. I did need to add baskets to some of the shelves in order to contain all the clutter, but with the easily manipulable shelves fitting everything in is easy.As I noted in my ikeahackers post, I did reinforce the smadal TV stand with a couple of L brackets because I didn't actually attach the cardboard backing to the unit nor did I attach it to the wall. 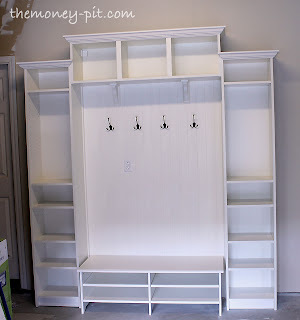 Right now my kids are too short to reach the hooks without climbing up onto the bench, and even with that wear and tear I haven't had any problems with it. The bench is rated to hold 110 pounds (per IKEA) so I am not worried too much about the kids sitting on it. 3. I can't find the Smadal unit on Ikea.com. Is it still available?I recently learned that Ikea has discontinued the smadal line. It is no longer available online or in stores. 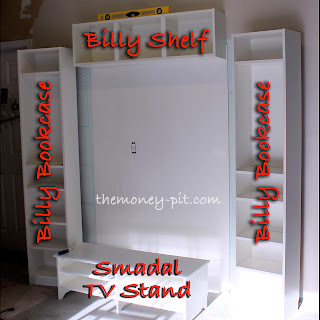 If I were going to build them now I would substitute out another Billy wall shelf for the Smadal unit. It would fit perfectly. It would be slightly shorter than the Smadal TV stand, but it woudl be easy to put four block legs beneath it to make it a bench. The price is actually 40$ cheaper so you would be able to do it for even less money! 4. What are the actual dimensions of the unit? 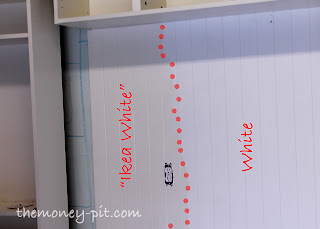 I recently did a project with Billy bookcases and found a hint online that Home Depot's Martha Stewart Talc color patches perfectly. It matched so well that I didn't even have to tape off the bookcases - smears and run overs didn't even show!! Lovely! Where did you get the beadboard? They sell sheets of beadboard at the Big Box Home Improvement stores! I think the BESTA TV Stand will work well at the bottom. We haven't built this yet, but the width is the same as the Billy aall shelf.